Files can be uploaded to the mobile device, downloaded, renamed, copied, moved and deleted. Detailed file properties may be displayed using the internal text viewer or will pop up automatically in the icon view. Files can be searched through the whole directory tree using wildcards and pattern matching. A memory usage indicator (at the lower right corner) and a corresponding command inform the user about the actual memory state. The user interface language may be changed by setting a configuration value - see section How to create and use language files later in this document. A tree view to the left side, which displays directories and their structure. In this window only navigation through the directory structure is possible by using single mouse clicks. Open, close the tree by clicking the + or - sign or activating a folder by selecting a name. Subtrees are automatically opened or closed when selecting a folder. A list view to the right shows the contents of the current active folder. File management is done by an easy and efficient way using this window only. A single mouse click marks an object and toolbars, pulldown menus and accelerator-keys can be used to apply a file management command. A double click opens a folder or executes plugins and configured default actions - like viewing, editing, etc. Mouse button 2 in the list window activates the context sensitive menu and displays possible command options - depending on the object which is placed under the current cursor position. The command is executed when releasing the button on a menu entry. The condensed list view displays as many files as possible in the list window right to the folder tree. The icon view displays large file type sensitive icons. A "bubble-information" shows detail regarding the file under the active cursor position. 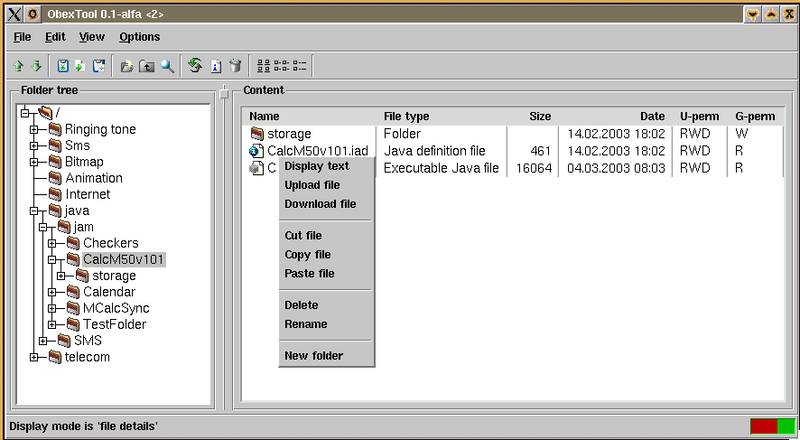 The file detail view displays detailed information for any file, like: name, size, modification date and permissions. Configure the internal text viewer to define which files are text-viewable. The configuration parameter ObexConfig(file,viewable) in the configuration file etc/obextool.ext defines which file types are "viewable". Configure external viewer programs in the configuration file etc/obextool.ext which are able to "display" data. 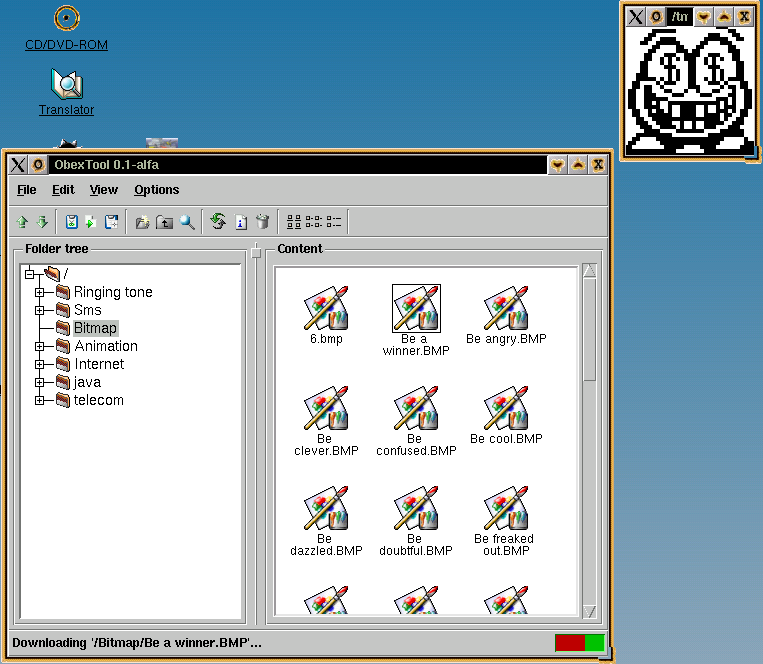 As example the great picture viewer XLI may be used to display bitmap files. Configure external editor programs in the configuration file etc/obextool.ext which are able to "modify" data. 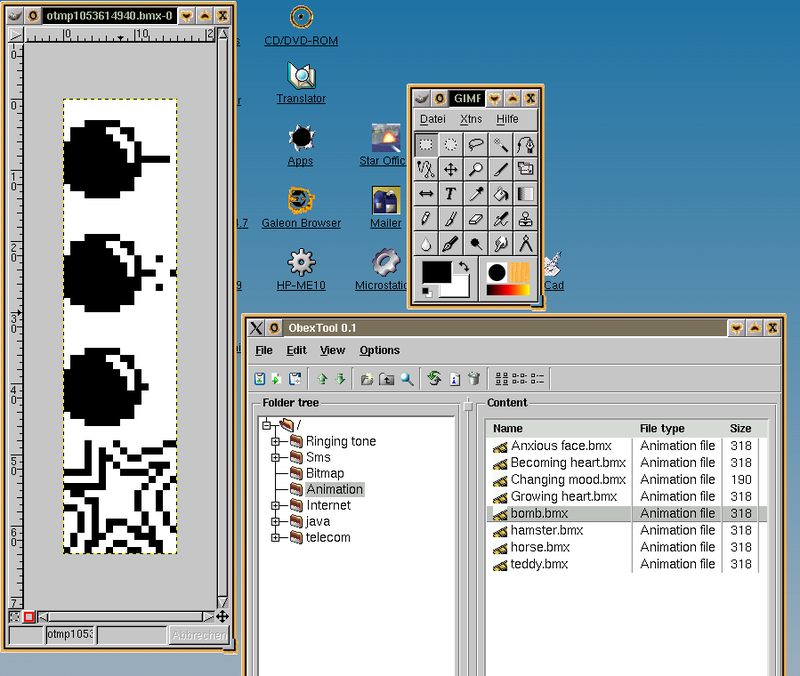 As example the GIMP may be used to edit and store modified Siemens Screensaver files, which are basically only four 16x16 bitmaps in one file. Self programmed TCL-plugins may be used to fully control and manage any data in the communication device. There is an SMS plugin available, which allows reading and saving the SMS contents in a text file. Also a plugin for VCal organizer files available (view a screenshot here). It supports online editing, scheduling overview and data export. Further details about ObexTool you can read on How to write ObexTool-Plugins.